Their recessed ribs provide improved countersinking and reduced surface dust, and their reinforced countersunk necks improve holding power. 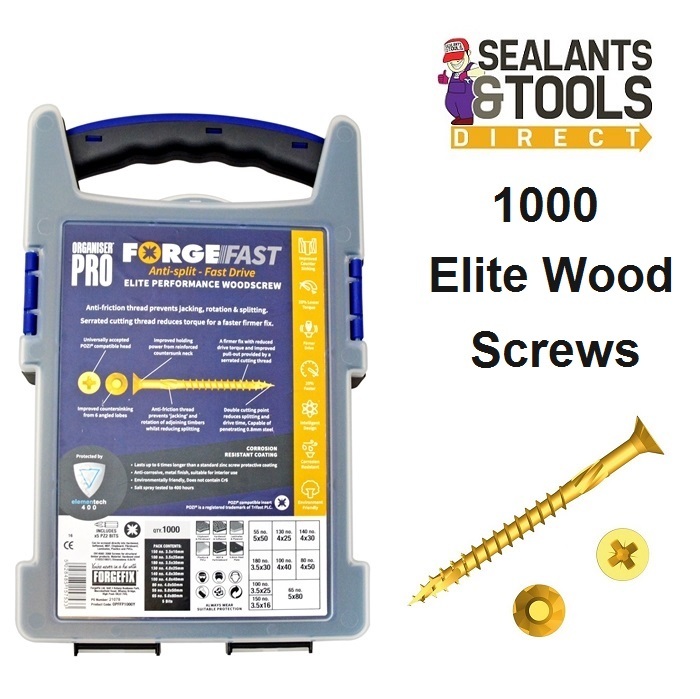 These Forgefast Elite screws have a patented drill and drive thread for reduced splitting of the timber, reduced 'jacking' and spinning of joined timber, increased pull-out and a firmer fix. Demonstration Video of the Elite Pozi Head Woodscrew. Serrated cutting reduces torque for a faster firmer fix and improved pull out provided by a serrated cutting thread. Double cutting point reduces splitting and drive time a sharp point provides faster bite and is capable of piercing 0.8mm steel. These woodscrews have an 'Elementech 400' coating providing an anti-corrosive metal finish, which lasts up to 6 times longer than standard zinc coatings. The coating is environmentally friendly and does not contain Cr6+. It is Salt Spray tested to 400 hours. Supplied with Pozi compatible bit's. See the full range of screws and fixings. You may also like to visit the Forgefix web site for more information.